This is a REBUILT Conrac Model DF Double Flare Machine. If you need to do single flaring, double lap flaring, or beading, this is an excellent choice. It's very simple to operate, and extremely fast to cycle. The unit is entirely pneumatically powered, and single lever operated. This machine has been reconditioned and comes with a one year warranty. 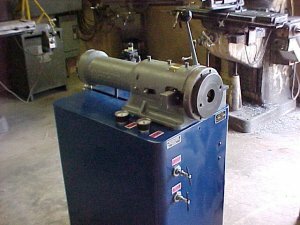 The staff rebuilding this equipment has over 25 years of experience in the design, manufacture, assembly and repair of tube benders, end-finishing machines, flaring machines and hydraulic presses. A full assortment of tooling for flaring, doube flaring and beading is available, and can be quoted as needed. Just email your tooling requirements to us admin@trysurplus.com, or give us a call at 800.624.7760 to discuss your needs. An Operator's Manual will be included with the equipment. Single Flaring Capability: 1/8" to 3/4" O.D. annealed ferrous or non-ferrous tubing. Double Flaring Capability: 1/8" to 1/2" O.D. annealed ferrous or non-ferrous tubing. Beading Capability: 3/16" to 1/2" O.D. annealed ferrous or non-ferrous tubing. Air Supply Requirements - 75/100 psi. Air consumption approximately 1-1/2 CFM at 100 psig. Machine Dimension: 18"W, 28"D, 42"H.
Weight (machine only): 480 lbs.